WASHINGTON, DC, November 29, 2010 (ENS) – The U.S. Fish and Wildlife Service has designated more than 187,000 square miles of on-shore barrier islands, denning areas and offshore sea-ice as critical habitat for the threatened polar bear under the Endangered Species Act. The designation identifies geographic areas containing features considered essential for the conservation of the bear that require special management or protection. Federal agencies are prohibited from taking any actions that may harm or damage critical habitat. Species that have critical habitat designated are more than twice as likely to be recovering, and less than half as likely to be declining, as those without it, say conservationists. The designation of critical habitat does not affect land ownership or establish a refuge, wilderness, reserve, preserve, or other conservation area. It does not allow government or the public access to private lands. A critical habitat designation does not affect private lands unless federal funds, permits, or activities are involved. The final designation, contained in a final rule that was submitted on November 23, 2010 to the Federal Register, encompasses three areas or units: barrier island habitat, sea ice habitat and terrestrial denning habitat. About 96 percent of the area designated as critical habitat is sea ice habitat. Sea ice habitat is located over the continental shelf, and includes ice over water up to 984 feet in depth extending to the outer limits of the U.S. Exclusive Economic Zone, 200 miles from shore. Terrestrial denning habitat includes lands within 20 miles of the northern coast of Alaska between the Canadian border and the Kavik River and within five miles between the Kavik River and Barrow, Alaska. 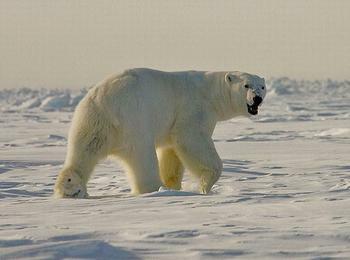 On October 29, 2009, the Service proposed to designate 200,541 square miles as critical habitat for the polar bear. The final rule reduces this designation to 187,157 square miles, a reduction due mostly to corrections designed to accurately reflect the U.S. boundary for proposed sea ice habitat. In addition, the critical habitat designated in the final rule differs from that originally proposed in several ways. The polar bear was protected under the Endangered Species Act as threatened, range-wide, on May 15, 2008, due to loss of sea ice habitat caused by climate change. Other threats evaluated at that time included impacts from activities such as oil and gas operations, subsistence harvest, shipping, and tourism. No other impacts were considered as significant in the decline, but minimizing effects from these activities could become increasingly important for polar bears as their numbers decline.